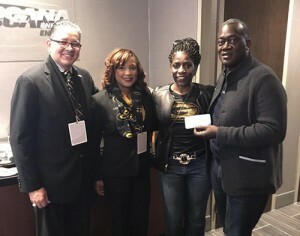 Perry and Monica Jones found their perfect match at Grambling State University, and now they’re using corporate matching gifts to support the university that launched their relationship and their careers. Perry Jones, a Chicago, Illinois, native, and Monica Jones, originally from Mobile, Alabama, both came to Grambling in 1980. She was a marketing and information systems major and graduated in 1983. He majored in industrial technology and automotive, and received his degree in 1984. “Grambling was an amazing experience for both us. It truly was the place ‘Where everybody is somebody.’ You just felt how invested the faculty and administration were in you personally. We came into our own at Grambling and made lifelong friends,” Perry Jones said. He is the senior vice president for North America, Manufacturing and Distillation – Diageo and she is director of Enterprise Sourcing for Cox Enterprises Inc. They have residences in Atlanta, Georgia and Naperville, Illinois. Giving back to the university that gave so much to them has always been a goal for the Joneses. “We have been blessed in our life together after Grambling and because of that we want to see that tradition continue with the next generation,” he said. In 2009, the Joneses committed to raising $100,000 for Grambling. Currently, they are over 50 percent of that goal with over $60,000 raised. “Due to some of the changes at Grambling over the years, we pressed pause on that commitment. However, we were re-energized with the creation of the Center for Professional Development under Otto Meyers and the outreach by Marc Newman after the installation of President Gallot. We have all the confidence in Rick and Marc’s leadership,” he said. “It was the gift from Monica and Perry Jones that really jumpstarted my understanding of the power and potential of fundraising at GSU and among the Grambling community. Their generosity came at a pivotal time for me. I was new to Grambling. Their personal support of me and my department’s success is greatly appreciated,” said Marc Newman, vice president for Institutional Advancement at Grambling. Much of the Joneses’ success in giving back has been through maximizing corporate matching gifts. “I’ve utilized company match where my company has matched my personal donations. It’s a way to get more money to your chosen charity,” he said. “The Joneses’ utilization of workplace giving is an example of how powerful the matching of giving amounts can be,” said Newman.